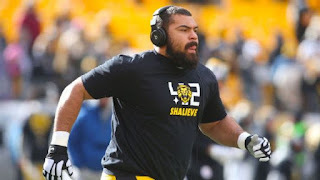 PITTSBURGH -- When the Pittsburgh Steelers took the field for warm-ups two hours prior to their AFC divisional playoff game against the Jaguars at Heinz Field, most of them were sporting the same shirt. The Steelers have worn various tributes in honor of linebacker Ryan Shazier over the past month after he injured his spine against the Cincinnati Bengals on Dec. 4. They've worn everything from customized cleats to T-shirts. This particular shirt was the first one specifically endorsed by Shazier and his family, who partnered with a local Pittsburgh shop called "Shop 412" to design and sell the shirts to the general public. Cameron Heyward donned a Ryan Shazier "Shalieve" shirt before kickoff against the Jaguars. The front of the shirt is "Shalieve," which has been a rallying cry for Shazier and the rest of his teammates since his injury. The number "412," an area code for Pittsburgh, and a lion are featured above the phrase. The back of the shirt also features a lion, a nod to Shazier's favorite animal. Shazier posted pictures of lions on his Instagram account throughout the season. His teammates have joined in, with some like Antonio Brown wearing custom cleats with Shazier's face and a lion on them, and others, like T.J. Watt, posting pictures of lions on Instagram as well. "The support over the last few weeks has been overwhelming and I can't thank you all enough. Just know, that without question, I #SHALIEVE in all of you too." A portion of the proceeds from the T-shirts will benefit spinal research as well as the Boys & Girls Club of Western Pennsylvania. Earlier this month, Ryan Shazier incorporated Shalieve LLC in Florida. On Jan. 8, Shalieve filed to trademark the word on hats, hoodies, pants, shirts, socks, bed linens and pillows. 0 Response to "Pittsburgh Steelers wear Ryan Shazier 'Shalieve' shirts before divisional game"